Here’s a quiz: Is it worse for a girl to tear her ACL playing soccer or for a boy to get multiple concussions playing football? Or what about a 9-year-old girl driving a go-cart head-on into a concrete wall, smacking her body into the steering column, hitting her head on pavement and – oops – having her coat catch fire? Is that the worst? Forget the answer key (though the last one is Danica Patrick), we are in the midst of an “epidemic” of sports injuries and the most concern is reserved for female athletes playing those ubiquitous Saturday morning recreational sports like soccer and basketball. The image hit the predictable soft spot. We may be past raising alarms about drafty rooms and fussing about female over-exertion (though Victorian-era rule differences persist in many sports), but the message is there: Doing “boy things” is not just inappropriate and unattractive for girls, it’s dangerous. This would appear absurd if it weren’t so familiar. Male athletes who suffer injuries (think Curt Schilling and Hall-of-Fame-worthy bloody sock or about any player in the NFL after week one) only appear more masculine for enduring pain. So why are female athletes who get hurt judged as pushing it a little too far, doing something they shouldn’t? It’s a double standard that’s been applied since forever – and with serious negative consequences. Public worry about girls getting hurt has kept females from access to higher education (blood needed for study would be drawn to the brain, leaving them weak and barren), from access to jobs, and the right to compete in sports. When female runners collapsed at the 800-meter race in the 1920 Olympics it became “evidence” of physical frailty and was used to ban women from distance events for generations (females could not run the Olympic marathon until 1984). The belief that female injury is socially and emotionally worse than male injury persists. We can’t stomach females in harm’s way (think Private Jessica Lynch) – and we don’t like to see pony-tailed girls getting knee surgery or on sidelines with crutches. Of course, there’s no checking in girl’s hockey or lacrosse, but there is for boys. And school districts have argued in court that protecting girls from injury is a valid reason to keep them off football and wrestling teams. Judges, however, point out that boys deserve our protection as much as girls do. One judge even ruled in the case of a female wrestler that the real injury was to her for being barred from the boy’s team. Pre-emptive fake “protection” based on the physical differences between females and males is damaging, just as casting girl’s knee injuries in soccer as an “epidemic” suggests a viral and pre-ordained result. (See, look what happens when you let girls play!) That’s because it’s difficult to discuss female athletes and not discuss political power. One had only to see the other magazine cover out in the same week as the Times cover: Danica Patrick on Sports Illustrated over the headline “Yes She Can,” an obvious nod to parallels between the gender trailblazing quality of Patrick’s Indy race and Hillary Clinton’s for the Presidency. Obviously, to the girls with ACL tears, the injuries are not politically charged, but real and troubling. But before we leap to frame the matter (yet again) around the weakness of the female body, let’s get youth athletics to pay more attention to conditioning, training, and injury prevention (for girls and boys) – and the big one: Making sure injured kids don’t play. We hear girls have greater thresholds for playing through pain, that they come back too soon from injuries, play when they shouldn’t and get hurt again. Where is the coach ordering them back to the bench? Certainly, required time off was the big message to come from last year’s “concussion crisis” in youth football. This is not about girls or boys and whose injuries are more disturbing, but about applying common sense – not paternalistic language and values — to youth sports. Featured image: Corner Field. CC0 via Pixabay. Eileen McDonagh is a Professor of political science at Northeastern University and Visiting Scholar at the Institute for Quantitative Social Science at Harvard University. Laura Pappano is currently a writer-in- residence at the Wellesley Centers for Women at Wellesley College. 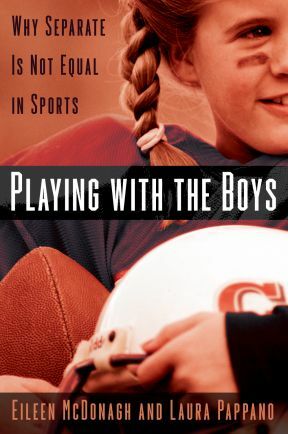 and co-author of Playing With The Boys: Why Separate is not Equal in Sports. A mouth guard that could cut concussions would be brilliant. Your point about prevention is key — and something that for female athletes has been a latecomer to public consciousness. Perhaps the issue is that girls were just “playing” while boys were engaged in athletic combat? We need to promote girls conditioning and training — and the right kind, not just any old thing to build random strength or speed. I’d like to know if either author ever played team sports? And if so which sports did you play? It seems to me you could not have played baseball or football or basketball with boys as a young adult. I have. I believe women can get stronger, but boys will always be stronger than girls and men will be stronger than women. They have different bodies. Boys in coed gym are very aggressive and do not pass the ball to girls period – they take over – they bully. I would not want to see girls become bullies for the sake of big strong muscles and to be able to play w boys. Girls have a blast playing together! Ask them! Also check out Wellesley, Smith, & Mt Holyoke.